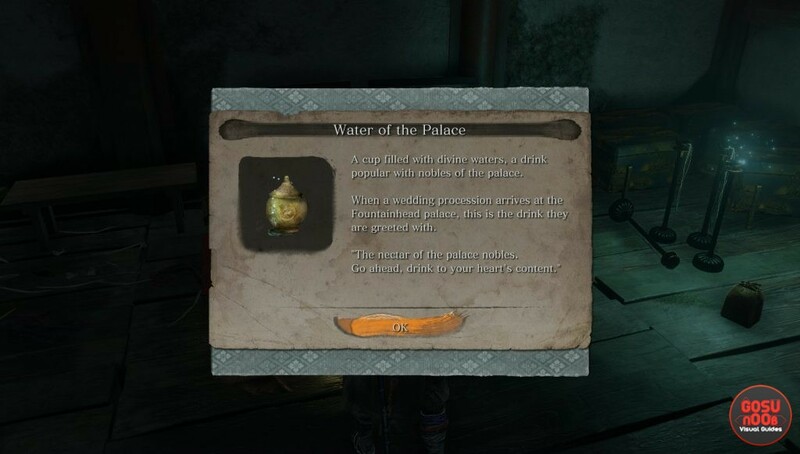 Water of the Palace is a key item in Sekiro: Shadows Die Twice. You can find it in a hidden area in Fountainhead Palace, and if you figure out what to do with it, you can get some sake and a handful of treasure carp scales as rewards. If you’re having trouble finding it, or figuring out where to use it, keep reading our Sekiro Water of The Palace guide. In order to get this unique item, you’ll have to reach the Fountainhead Palace. Once you’ve unlocked most of the area, spawn at the Flower Viewing Platform idol. Turn around and enter the big courtyard behind you. Follow the right wall until you reach a hole in the ground, filled with water. Dive in, and once you get out, you’ll find yourself in a room with a bunch of items on the floor and a single, glowing chest. Open the chest, and you’ll find the Water of The Palace inside. There’s only one place you can use the Water, and it’s in Mibu Village, in the Ashina Depths area. There’s a lone house with a shinobi trapdoor in the floor. Use the door, and you’ll find a desperate monk inside, muttering to himself. As far as we know, he’s the only NPC you can give the Water of the Palace to. When you do, he’ll reward you with a bottle of Dragonspring sake. The next time you visit him, he’ll be hostile. Defeat him, and he’ll drop five treasure carp scales. A cup filled with divine waters, a drink popular with nobles of the palace. When a wedding procession arrives at the Fountainhead palace, this is the drink they are greeted with.